4 Tips to Survive the Holidays for Retail and Restaurant Operators! The countdown is on, 9 days before Christmas. For many of you the actual countdown goes out to January 6th when all the holiday related spending is complete. For our retail friends, the next 9 days holds lots of purchases and after that there are more purchases but also the returns and exchanges. For our restaurant friends January 6th signals back to normal dining levels. So between now and then everyone gives their best and works hard. This is one of the highest revenue producing periods for both retail and restaurant and one of the most challenging. Managing inventory so you don’t run out, delivering a great experience for all customers and keeping employees happy when they all want the same days off – are all real challenges. So here are my 4 tips to survive. If you only make it to one – the first one is the easiest, cheapest and takes the least time – but has a huge impact. Deep Breathe – no I am not kidding. I am a firm believer in the power of deep breathing and there is lots of research to support the benefits of deep breathing. You can do this anywhere – but is most impactful when you can be someplace quiet. The key is to stick out your stomach as far as you can and then push it in as far as you can. Sit, stand or lay down. Breathe in through your nose for 8 seconds and really fill your belly. Hold the breath for 4 seconds. Then slowly release through your mouth for 8 seconds pushing your abs at the end. Do this for 5 minutes and you have now reduced your stress, blood pressure and many other physical bi-products of stress. Here is a link to an article with a complete 13 benefits to deep breathing just in case you don’t believe a VP of Marketing. Stay Organized – easier said than done. I am a fanatic list person. I have lists on my phone, on post-it notes, in a notebook, and sometimes even in my head. Lists are the only way that I make sense of my crazy schedule during the holidays. Right now, tying up year end requests and working with clients to get loyalty programs started. My favorite year end tradition is a day of organization. I go through all my files and notes. I purge the old and make room for the new. Even though I am not delivering results on that day – I am reducing my stress so that I can deliver better results in 2014. I love finding notes from customer meetings and thinking back on how we helped simplify their marketing. Gratitude. My favorite saying to my kids is to always have an “Attitude of Gratitude”. This is so important for everyone, but especially business owners. You have built a successful business because of amazing relationships that you have with vendors, employees and customers. It is quite easy to say thanks to your vendors and your employees and you should never miss the chance to say thanks. Your gratitude goes a long way when challenging times come for businesses. Can you effectively say thanks to your customers? Do you know who they actually are? If you don’t, 2014 is a great time to start getting your customer information so that December 2014 you can really say thanks to your customers! Random Acts of Kindness. Every year I create something small for all of our employees. Usually it is some kind of food item. 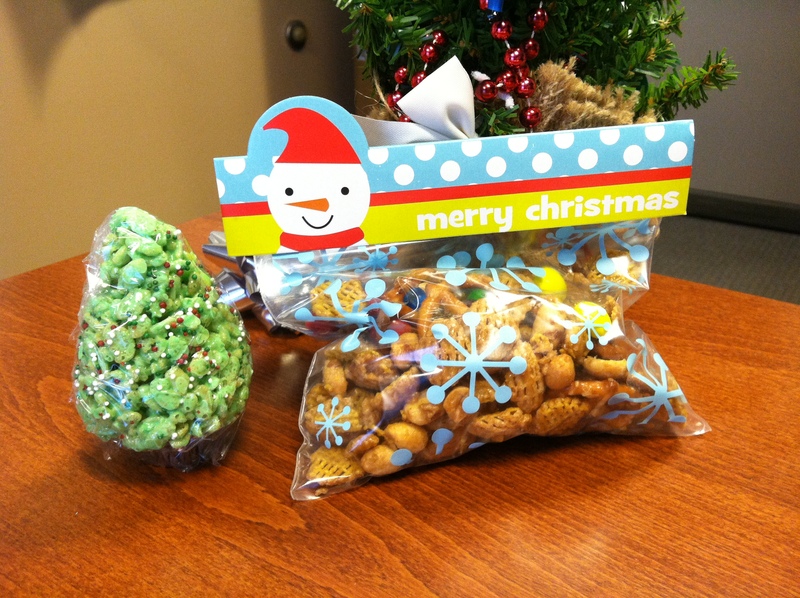 This year I made a snack mix and Rice Krispie trees (check out the picture). I also send notes to my daughters to give them encouragement during finals. Just simple acts can make a huge difference. Is there something you can do for an employee or a customer that would catch them off-guard and make them smile? Keep it simple and sincere. I hope these tips will help you survive the holidays. Tecmark is here to make marketing simple, so let us help you in 2014 really know your customers and connect with them more than once a year. Our low-cost marketing solution makes it easy for customers to join, easy to communicate to them the way they prefer – email or text – and finally easy for your employees to implement.